This package of material comes from the Wayne Petersen collection. It is a combination of certificates acknowledging awards Barney Oldfield received and correspondence between him and others of the era. An interesting item is an article authored by Oldfield's nemesis Ralph De Palma, who describes a huge risk Barney took to edge out the 1915 Indianapolis 500 winner in a match race. This is an interesting article because it was written by Barney Oldfield's chief rival, Ralph DePalma. Awarded in 1937, this is a copy of certificate presented to Barney Oldfield by the Berkley Traffic Safety Commission. Presented nine years before his death, Oldfield continued to parlay his well established name for gain late in his life. This is a 1934 letter written to Barney Oldfield by an Chrysler executive. 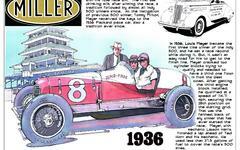 This was during the period Oldfield was teaming with Billy Arnold in Chrysler "hell driver" exhibitions. This is a copy of a letter that was sent to Barney Oldfield asking him to attend a "Golden Jubilee" celebration as the automobile industry turned 50 years old. The letter is dated April 2, 1946 - almost exactly six months before Barney Oldfield would pass away quietly in his home on October 4, 1946. This is a letter congratulating Barney Oldfield on being selected for membership in the Automobile Hall of Fame in June 1946. Oldfield would pass away quietly in his home less than four months latter on October 4, 1946. This is a digital copy of the certificate presented to Barney Oldfield upon his election to the Helms Hall of Fame.